Schmuel Gelbfisz was born in Warsaw, Poland to Hasidic Jewish parents. In 1899, he arrived in New York, where he became a successful salesman in the garment business. He soon began to pursue a career in the filmmaking industry. Together with his brother-in-law, Jesse L. Lasky, and a theater owner, Adolph Zukor, he produced his first film with a young director named Cecil B. DeMille. In 1916, Goldwyn cofounded Metro-Goldwyn-Mayer with Marcus Loew and Louis B. Mayer, a production company that would soon be famous not only for its films, but also for its "Leo the Lion" trademark. 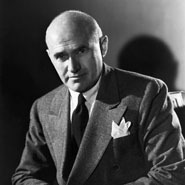 Two years later, Goldwyn left the joint venture to form his own company, Sam Goldwyn Studio. For more than three decades, Goldwyn made successful films, including the Academy Award winners Wuthering Heights (1939) and The Best Years of Our Lives (1946).